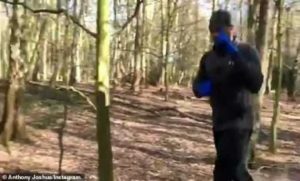 Anthony Joshua has gone back to his basics training on Monday as he went for a run through the forest ahead of his fight against Jarrell Miller. Though Joshua is believed to have earned close to £100million during his unbeaten boxing career, he still lives in a cosy, two-bedroom flat during his strict training camp. He made the most of one of the South Yorkshire city’s green spaces as he lacedup his trainers and went for an early morning run. The video was accompanied by the caption: “Road work like it’s 08”.